Time to start catching up with my posts. 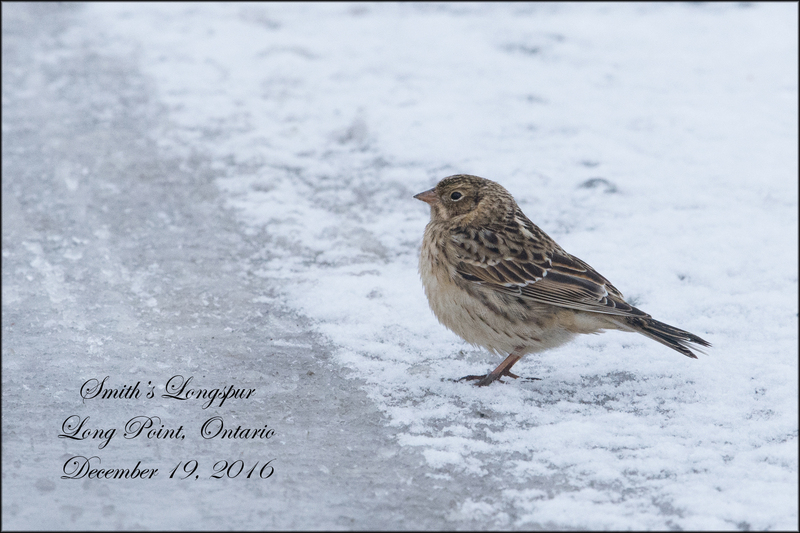 I heard about the Smith’s Longspur being seen, near Long Point, Ontario on December 17th, a few weeks before the January 1st 2017, date I planned to get going again after a few months break, from birding. This was a great bird and I just couldn’t pass it up but the 7 hour drive through Toronto, wasn’t that appealing. I checked for flights and the prices were out of this world so my only choice was to drive. So I decided to go on the 19th of December if it was still there…I waited at home, until I saw Rex Bartlett’s post that the bird had been seen at 8:10am. I jumped in the car and off I went. 611 km from my door, through Toronto traffic, after being stuck for an hour in Oshawa and then again in Pickering, I arrived at the area at 3:33pm. Most of the people were packing up after having seen the bird, I could see the flock feeding by the side of the road and the Longspur was among them. 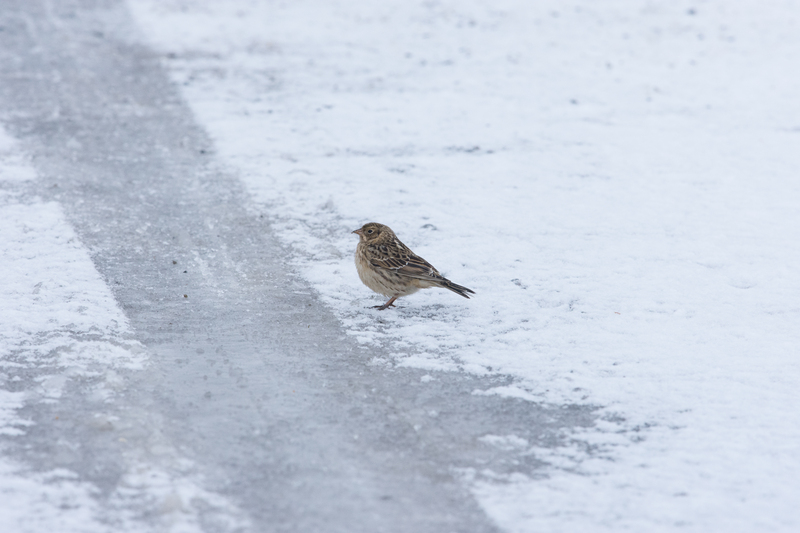 Pulling over to the side of the road to have a better look, a car coming the other way spooked all the birds…..I though here they go but to my surprise the birds flew in a circle and landed right beside my car, leading the way was the Smith’s Longspur. After 30 minutes the light began to fade and it was time to drive back the 611 km to home. I stopped for a bit to visit with friends in Toronto and got home at 1am. 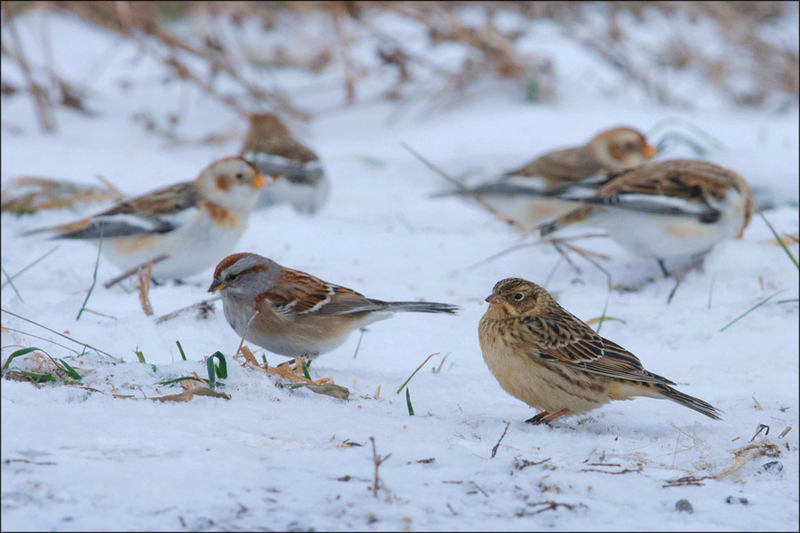 Someday I’ll visit Churchill to see this bird in breeding plumage but for now, it will have to do. wow thats a long drive to see a bird. you were only an hour from my house…you could have stayed the night. Nice Paul! I need that bird!